About a decade ago, the FDA started requiring drugmakers to add black box warnings to labels and prescribing information for Soroquel and other antipsychotic drugs. The agency made the change after the medications were linked to an increased risk of death among elderly dementia patients. The antipsychotic drug Seroquel was approved by the FDA years ago to help people with schizophrenia, bipolar disorder and other serious mental illnesses. But too frequently the drug is also given to people who have Alzheimer's disease or other forms of dementia. The problem with that? Seroquel can be deadly for dementia patients, according to the FDA. 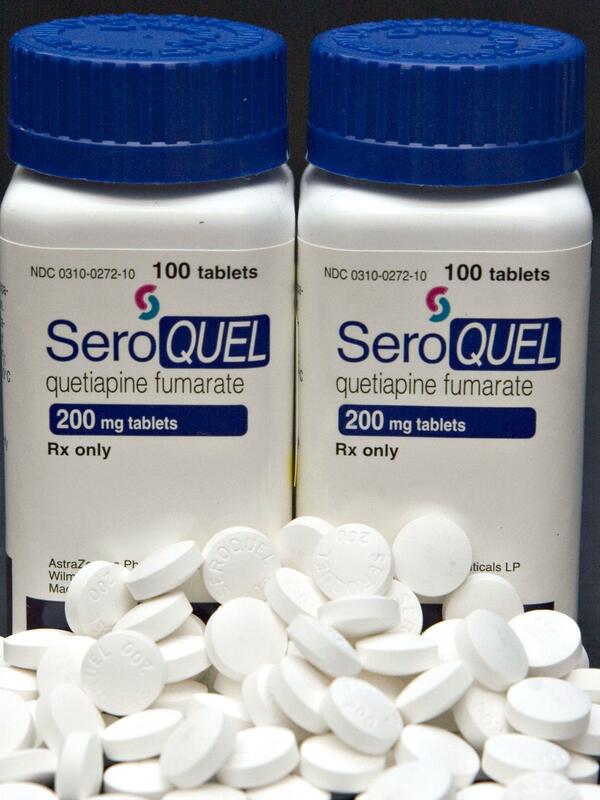 Now some researchers have conducted an experiment that convinced some of the general practice doctors who prescribe Seroquel most frequently to cut back. All the scientists did was have Medicare send letters — three of them over the course of six months — to the roughly 5,000 general practitioners who prescribe Seroquel the most. The letters (attached to this document) had two elements: First there was a peer comparison aspect. The doctors who got the letters were told that they wrote a lot more prescriptions for Seroquel than the average for their state — in some cases as many as 8 times more. The Centers for Medicare and Medicaid Services which regulates Medicare, was a partner in the study and sent the letters. So, in addition to peer pressure, the notes contained a government warning: "You have been flagged as a markedly unusual prescriber, subject to review by the Center for Program Integrity." Researchers then tracked the physicians' prescribing habits for two years. "We found that the doctors cut back about 16 percent over that time period — which was a pretty large change," says Adam Sacarny, an assistant professor at Columbia University's Mailman School of Public Health and the lead author of the study. The decline included both patients who could benefit from Seroquel and patients who could have been harmed by it, he said. Also significant? When doctors stopped prescribing Seroquel, they didn't just switch to a different antipsychotic drug. It's hard to know from this study whether the doctors were more responsive to being out of step with their peers or to the threat of coming under increased government scrutiny. It's important to find that out, says Dr. Joshua Liao, who co-authored an editorial accompanying the study in JAMA Psychiatry. "While interventions such as these letters can work," Liao says, "the ability for policymakers to scale them more broadly — to more physicians, to other conditions and prescribing or nonprescribing behaviors — depends on this information. We need to understand what components work." And for anyone who wants to stop the common practice of overmedicating dementia patients, curtailing the use of antipsychotics is just the beginning, says Dr. Helen Kales, a professor of psychiatry at the University of Michigan and the head of the school's Program for Positive Aging. There are lots of other kinds of drugs that affect the brain. For example, Kales says, "the use of mood stabilizers [in dementia patients] ... has actually accelerated." Such drugs include the anti-seizure medicines Depakote and Tegretol. "So any kind of fixation on one [drug] — it's maybe winning the battle, but not the war," says Kales. She recently chaired an international committee of dementia specialists who published a consensus statement in the journal International Psychogeriatrics on the ways dementia behaviors like agitation and wandering should be treated. It's usually better to find out what triggers the difficult behavior, she says, or to modify the patient's environment. "The highest ranked and endorsed treatments are all non-pharmacological approaches," Kales says. But that kind of treatment takes more time, and has been slow to catch on, she says. It will never be as easy as dispensing a pill. The antipsychotic drug Seroquel is approved to treat people with serious mental illnesses, but frequently, it's also given to people with Alzheimer's disease or other forms of dementia as a sedative. The problem with that - this drug can be deadly for dementia patients according to the FDA. NPR's Ina Jaffe reports on an experiment that got one group of doctors who prescribe Seroquel the most to cut back. INA JAFFE, BYLINE: What the researchers did seems almost too simple. They identified the roughly 5,000 general care physicians who prescribe Seroquel the most and then sent them some letters. ADAM SACARNY: We did expect the letters to get their attention. SACARNY: This kind of peer-comparison message. They say that the doctors wrote more prescriptions of Seroquel than their peers. JAFFE: As much as eight times more in some cases. The federal agency that regulates Medicare was a partner in the study and sent the letters so doctors were also warned, quote, "you have been flagged as a markedly unusual prescriber subject to review by the Center for Program Integrity." After three letters like this, Sacarny and his team track the doctors for two years. SACARNY: And we found that the doctors cut back prescribing by about 16 percent over that time period, which was a pretty large change. JAFFE: The decline included both patients who could benefit from Seroquel and patients who could have been harmed by it. Also significant - when doctors stop prescribing Seroquel, they didn't just switch to a different antipsychotic drug. But for dementia patients, antipsychotic drugs aren't the only issue says Dr. Helen Kales, a professor of psychiatry at the University of Michigan. HELEN KALES: The use of mood stabilizers - that has actually accelerated. So any kind of fixation on one agent, it's maybe winning the battle but not winning the war. JAFFE: Kales chaired an international committee of experts that just published their recommendations for treating dementia behaviors, like agitation and wandering. The recommendations are in the journal International Psycho Geriatrics. KALES: The highest-ranked and endorsed treatments are all nonpharmacologic approaches. JAFFE: Like finding what triggers the patient's behavior or modifying the environment. But Kales says that kind of treatment has been slow to catch on and will never be as easy as dispensing a pill. (SOUNDBITE OF ESBE'S "FLOAT") Transcript provided by NPR, Copyright NPR.